Manufacturing can be a dangerous business, it is one of the industries with the most workplace injuries and fatalities. 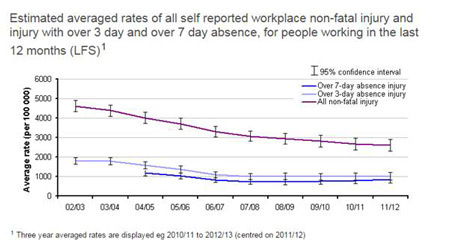 It accounts for only 10% of the UK workforce, yet is responsible for almost 20% of the injuries. On average, there 31 fatalities per year from manufacturing workplace accidents, along with above 4,500 cases of major injuries and 19,500 cases of injuries that caused workers to miss three or more days of work. So, health and safety should be a high priority for anyone involved in manufacturing. There are various steps to be taken in order to reduce the risk of workplace accident or injury occurring. Improving health and safety measures can really make a difference when it comes to injury rates in the manufacturing industry. For instance, the Australian government introduced a National OHS Strategy, particularly targeting industries with a high incidence of injury - including the manufacturing industry. After the national initiative, the manufacturing industry saw a 38% fall in the number of workplace injuries and this drop in incident rates was true for all of the sub sectors of manufacturing. For example, the sector with the highest drop in rate of workplace injuries was textile, footwear, clothing and leather sector with a 52% decrease. Whereas the wood and paper product sector saw the smallest drop with 18%. Accident and injury rates of UK manufacturing have also decreased over the years (as you can see if the graph below). Whilst this is positive progression, it’s important to keep this downward trend going and that means further understanding the areas of potential hazard and how the risk can be limited. There are a myriad of health and safety factors to consider, which will vary depending on sector and specific circumstances of a manufacturing environment. Consequently, I will touch on a few general points that are true for most sectors in terms of accident prevention. Moving machinery is one of the main causes of fatalities, major, and minor injuries within the manufacturing industry; it accounts for 19% of manufacturing fatalities, 13% of major injuries and 11% of minor injuries in the UK. One way to account for this is to ensure you have strict health and safety protocols pertaining to use of machinery – if incident rates are still relatively high in this area for your workforce, it might be worth revising the protocols as it is one of the riskiest factors in manufacturing. Another way to lessen the likelihood of an accident with machinery is to regularly check if it’s working properly as a malfunction at the wrong time can easily cause an accident. Preventative maintenance is commonly used within the manufacturing industry to ensure machinery is functioning correctly. A thermal imaging camera can be utilised to assess if a system is overheating, which is often the first sign of a problem and therefore the issue can be pre-emptively solved before it causes a breakdown or malfunction. Not only is this a positive in terms of health and safety, it has the added benefit of potentially saving money in the long run. For instance, statistics indicate that preventative maintenance saves on average $500 for minor to medium fault and $3,000 for large faults – repairing machinery after a breakdown or malfunction is a lot more costly than fixing the initial misalignment before it can cause other problems. A further major health concern in the manufacturing industry is the high rate of ill health caused by workplace exposures; roughly a quarter of occupational cancers and deaths are due to workplace carcinogen exposure in the manufacturing industry. Mineral oils in particular are one of the largest contributors to occupational carcinogen exposure – they are responsible for over a quarter of these kinds of fatalities. Previous exposure to asbestos can also be lethal, accounting for 15% of workplace exposure deaths. Other significant occupational carcinogens are dioxins and welding fumes. There are legal limits to the occupational exposure to these carcinogenic substances, however these are founded on a risk-based approach. Really anything that can be done to limit or eliminate exposure to these substances is better for health and safety. A paper from the Health and Safety Executive discusses how to improve compliance to health and safety protocol, after all what use are procedures if they aren’t being properly adopted and practically executed by the workforce? The document gives a specific example from the manufacturing industry; there were pre-shift checks for mining machinery and these checks were estimated to take more time than the workers shift. The manufacturer admitted the time required for the check was exaggerated in an attempt to make sure at least some of the checks were carried out. It actually tends to lead to a reluctance to adhere fully to any of the procedures and often a shorter version of checks is adopted as the norm and passed on to new employees. It’s important to ensure that the protocols you have regarding health and safety are reasonable and taken seriously by employees – to create this may require discussing current procedures with your workers and coming up with checklists and actions which simultaneously ensure safety standards are met and also balance employees concerns and practical time restraints. A key part of continuing the progression of health and safety in any industry is identifying the areas where the most risk still lies. So, here are some of the trends within the manufacturing industry which highlight some of the areas that are particularly still in need of improvement. 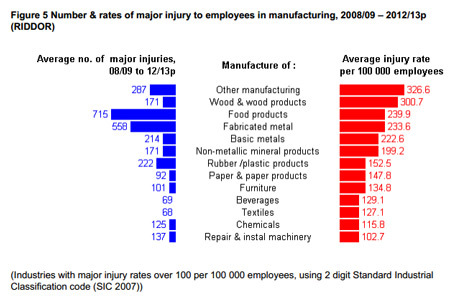 As you can see, food manufacturing is one the most dangerous sub-sectors of manufacturing - it has one of the highest rates of injury out of all UK industries and has almost double the rate of injury as the manufacturing industry average. Because of the variation throughout different subsectors of the manufacturing industry, it’s important that health and safety protocols are tailored to the specific sector. In general, after variation from occupation is accounted for, there are no other significant predictors of workplace injury, gender included. Distinctively within the manufacturing industry, there is a gender divide when it comes to workplace incidents. Research published earlier this year found that when factors such as job and plant type are controlled for, women working in manufacturing are at a higher risk for injuries that require medical treatment, first aid and work restriction than men. The authors of the paper suggest that because men in general tend to work in riskier industries (therefore having higher overall injury rates) the risks for women who work in traditionally male occupational are underestimated. Hopefully with increased awareness of the common problems in manufacturing health and safety and with further introduction of possible solutions to these problems, the rates of injury and fatality within the industry will continue to decrease.